The typical healthy human brain contains about 200 billion nerve cells, called neurons, all of which are connected through hundreds of trillions of small connections called synapses. 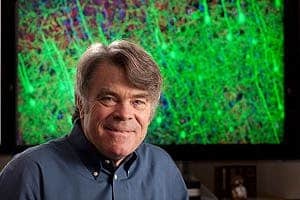 One single neuron can lead to up to 10.000 synapses with other neurons, according to Stephen Smith, PhD, professor of molecular and cellular physiology. Along with a team of researchers from the Stanford School of Medicine, he was able to quickly and accurately locate and count these synapses in unprecedented detail, using a new state of the art imaging system on a brain tissue sample. Because the synapses are so small and close to each other, it’s really hard to achieve a thorough understanding on the complex neuronal circuits that make our brain work. However, this new method could shed some new light on the problem; it works by combining high-resolution photography with specialized fluorescent molecules that bind to different proteins and glow in different colors. The computer power required to achieve the imagery was massive. A synapse is less than a thousandth of a millimeter in diameter, and the spaces between them are not much bigger either. This method, array tomography, is at its starting years, but as time passes, it will probably become more and more reliable, and more and more efficient.